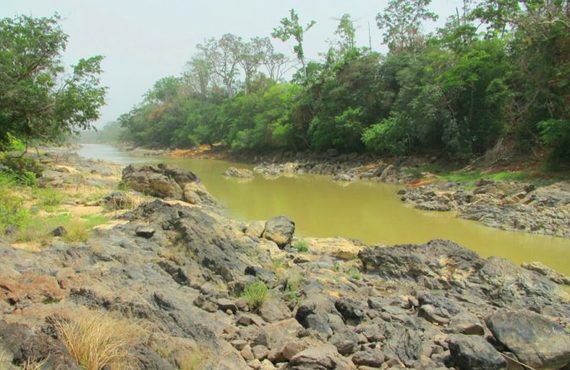 The license area is situated in the central part of the Mongo Basin, with linear stream bed flowing to the west-south-western direction after being developed under the control of regional rifting mechanism in similar direction. The Kaba is a 6th order tributary of the Mongo River that empties directly into the Atlantic Ocean. There are numbers of drainage systems which are governed by the topography of the license area. These rivers or streams are the Makuranko, the Makoungi, the Matiri, the Gbonkobon, the Matui, the Mabokotona and their related tributaries. Absolute heights of the relative level within the concession boundary vary from 94 meters to 503 meters. Average height makes up 295 meters with standard declination of 112 meters which shows significant landscape unevenness within the area. See Figure 1 and Figure 2. From the geostructural point of view, the area is located entirely within the western part of the Leonean-Liberian fundamental crystalline granitic formation. The elevation has a clear fluvial type, thence erosional in the most part of the eastern segment and erosional deposition in the west. Geomorphological peculiarities of the surface show much presence of lineaments in the area, mainly of tectonic origin. The area has a wide-ranging terrain, with spontaneous mountain ranges with characteristic scarp erosional slopes. Average slope steepness makes up 10 degrees, but steepness can be as high as 38.7 degrees with standard declination of 6.5 degrees. Scarp slopes have been created be means of very contrasting natural bends which shows high neotectonic activity of the area with positive vertical dynamics accompanied by intensive washing-out of rock beddings. Slope aspects have clear space lineation with several arc elements which emphasizes the tectonic feature of the landscape formation at the relative level. MAGNUM LINK (SL) LIMITED began preliminary exploration work on the mineral right property since the granting of the license in May 2013. Due to operational, health and safety reasons linking the emergence of the Ebola Virus Diseases (EVD) in West Africa and in particularly Sierra Leone, there was need to seize active exploration activities thereby forcing the camp to go into care and maintenance. The end of the EVD saw a resurgence of the company efforts to continue interpreting and analyzing acquired data sets from remote sensing platforms. Networking with relevant stakeholders and the technical team in Sierra Leone is underway to advancing the project and gaining access to improving community confidence. During the reporting period under review, a desk top study was carried out on all available information relating to geological literatures and mineral potentials of the license area and previous work carried out suggests gold mining activities in the past. Relevant geological literatures obtained from the Geological Survey Library and activities carried out by other sources also suggest indications of gold, nickel and other base metals. The programme is expected to follow-up previously identified targets in an area known to host economic mineralization.